Have your kids fallen in love with kinetic sand? Mine have! In fact my 8-year-old had it at the top of her very short list for Christmas. 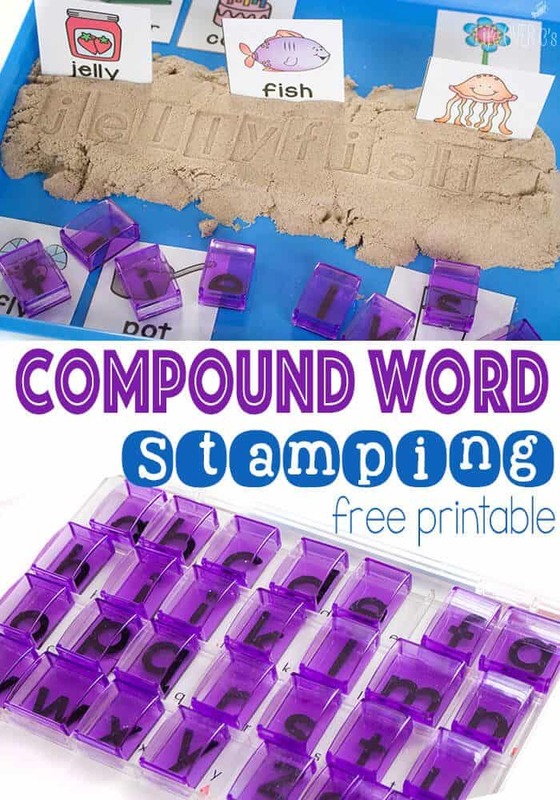 So this week as we work on compound words, we are using our kinetic sand for stamping the words. 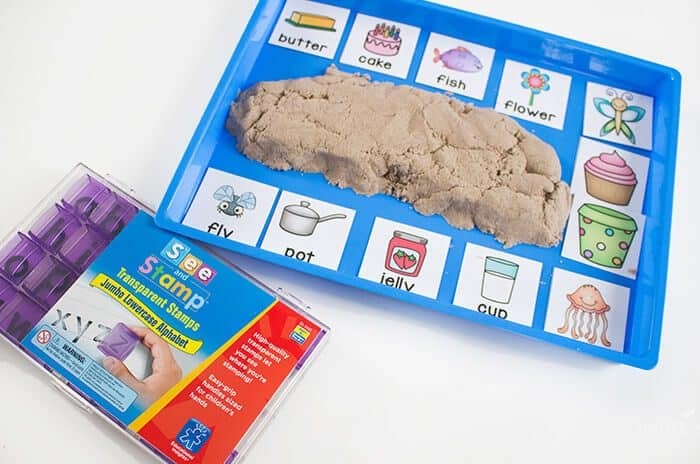 Stamping compound words with kinetic sand is a great way to work on spelling & fine-motor skills while using the kids’ favorite “dough”. 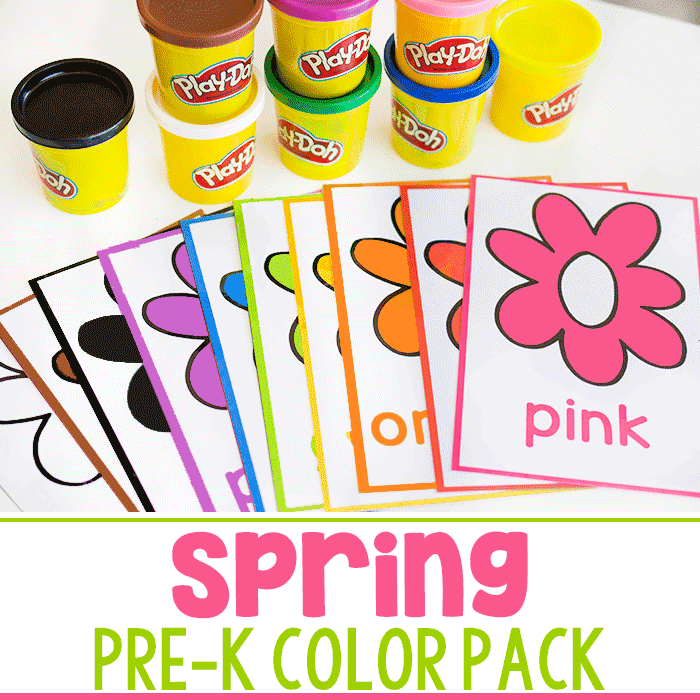 To prep: Print and laminate the word cards. Cut them apart. I chose to display 4 of the 16 word sets on the tray with the kinetic sand. You can choose to display more, but that is what we had room for. I will switch out the words as we use them to create a “new” activity. We selected one of the picture-only cards that represent the compound words and then found the matching word-part cards to learn the correct spelling. 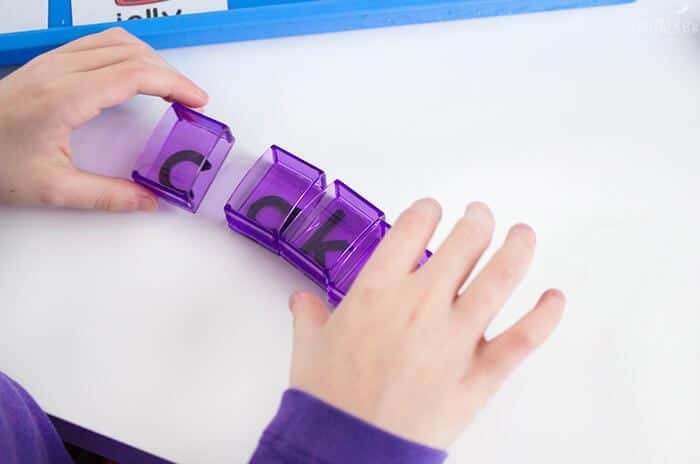 Moving to larger words can seem difficult to new readers. It’s hard for them to see the individual sounds within the words. 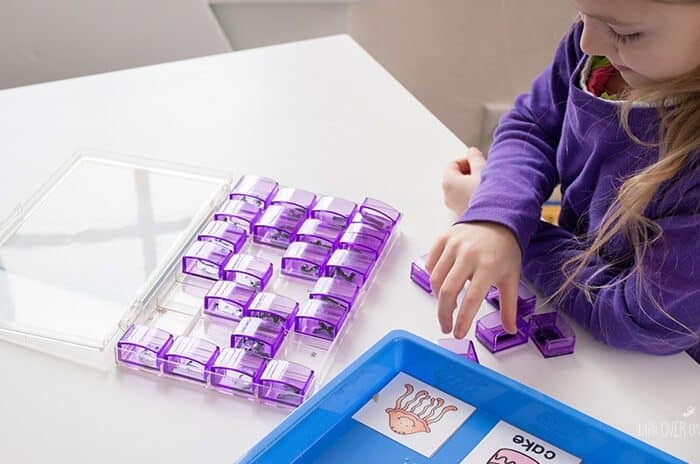 By starting the transition with compound words, kids quickly learn that larger words are made up of smaller words or sounds that they are already familiar with and they can decode the words using the sounds they know. 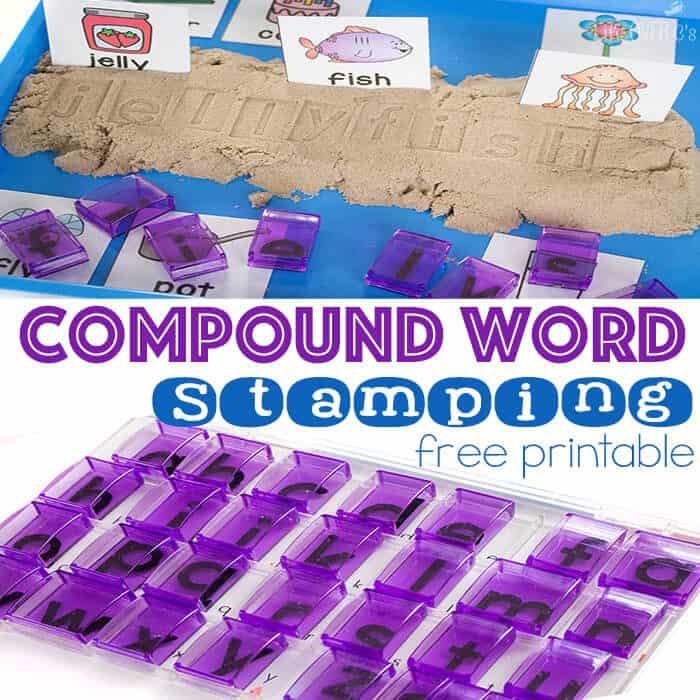 Kids can easily recognize the words on the picture-supported cards and use them to create the bigger compound words. 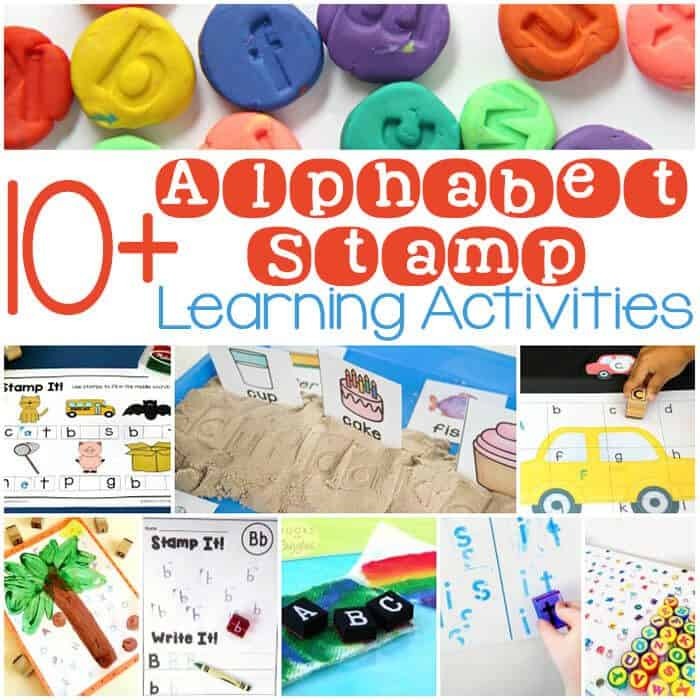 We displayed the cards on the kinetic sand and then used the jumbo lowercase alphabet stamps to press the letters into the kinetic sand. 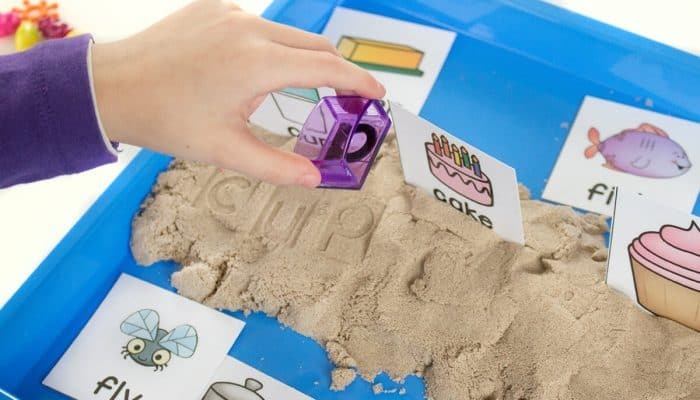 I noticed that as she pressed the stamps into the kinetic sand that it was giving her fingers a good workout. 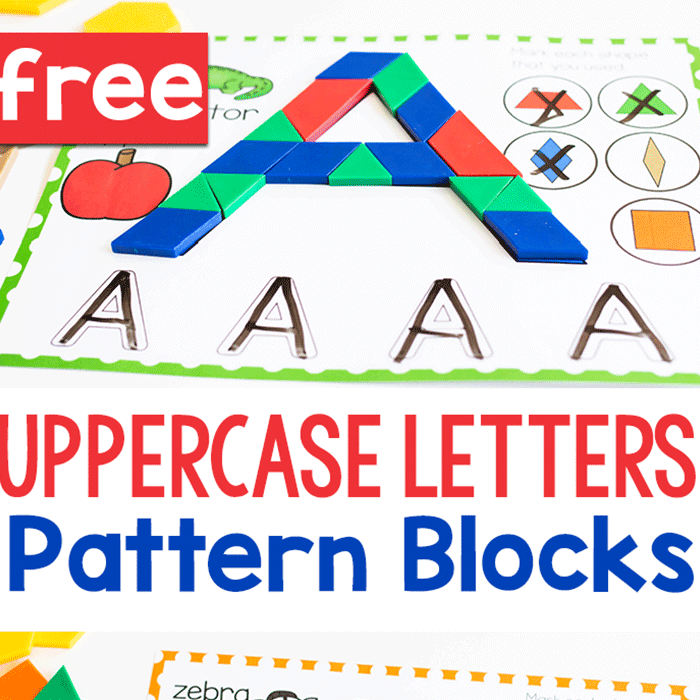 Which is great for building her fine-motor skills. You could choose to have the kids record the finished words in their notebooks for additional practice. Or take pictures with an iPad or iPhone for a quick assessment of understanding. 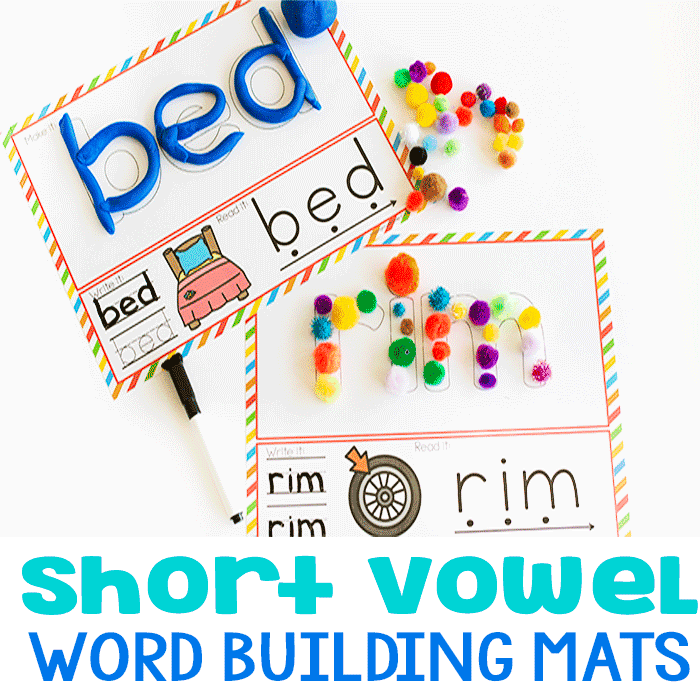 Another fun activity is to have the kids think of more compound words and draw pictures in their notebooks to represent the word parts. Such a fun idea! My son loves kinetic sand, so I’m sure this would be a hit. Definitely saving for future reference. WhaT a fun way to learn compound words! I love thiat stamp set! 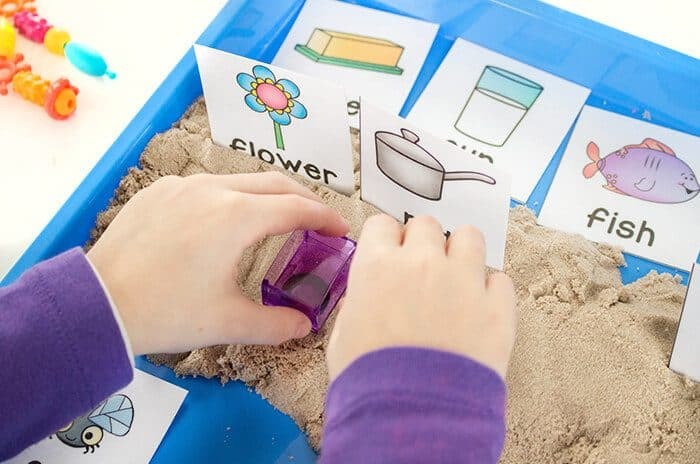 Wow – I had never even considered using stampers in kinetic sand. This opens up a whole range of activities for us – thank you! What a creative use of kinetic sand! I’m going to have to use this one for practicing spelling words! Thanks for sharing at the Thoughtful Spot! We just have one set that we use for both kintetic sand and ink. You can just give them a quick rinse after you are done using them in the kinetic sand. 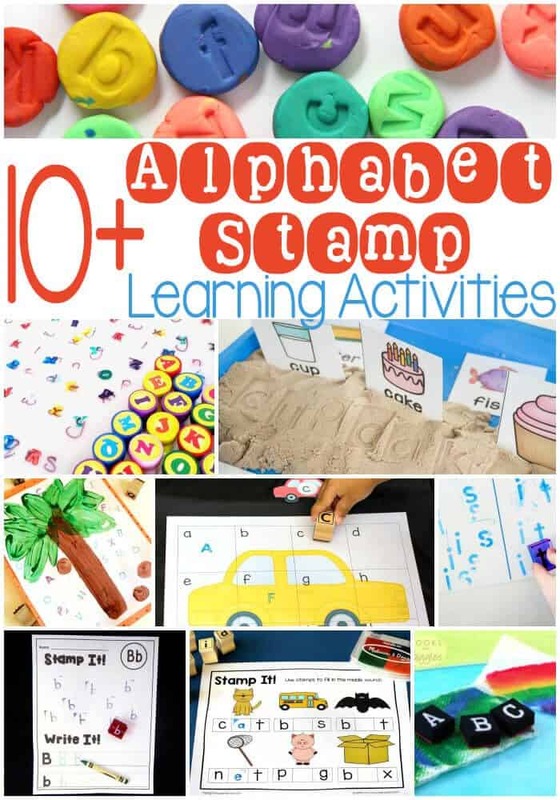 Thank you for all the printable activities! How do you store all of them after laminating? I have so many for different themes and I can’t figure out a good way to store them all when not in use…thanks! I keep each activity in a gallon size plastic bag and then store them in a plastic storage tub for each theme.